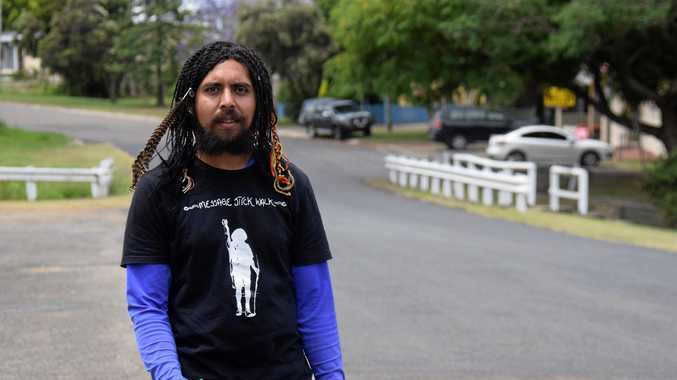 ONE Indigenous man is letting his feet do the talking as he campaigns for a stronger Indigenous voice in Parliament. Alwyn Doolan is from the Aboriginal community of Woorabinda in Central Queensland. 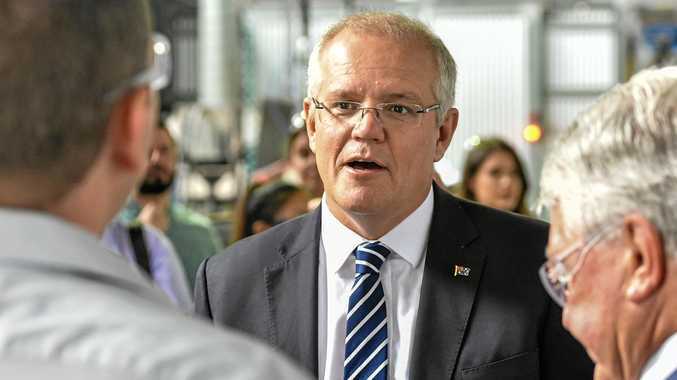 He is currently right in the middle of a year long extraordinary mission, which this week took him through the South Burnett. 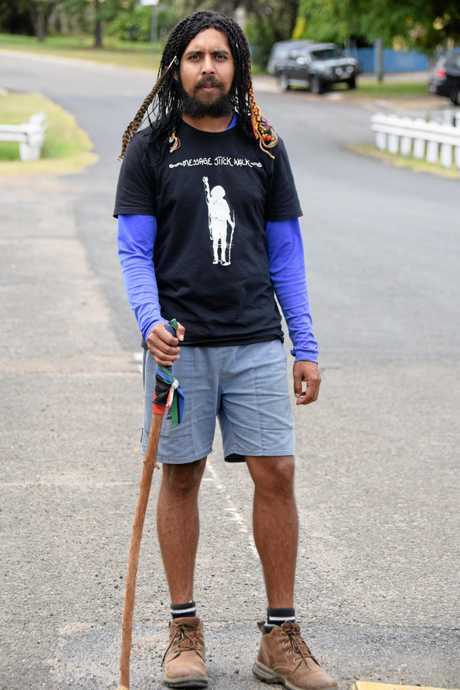 He set off from the tip of Far North Queensland and is currently in the middle of a 7000km journey walking his way to Parliament House in Canberra. "It was just a case of having a bit of an identity crisis within myself," he said. "I was concerned how I was perceived outside of my Aboriginal community." Mr Doolan is walking solo on average over a marathon distance every day on his way to Parliament House in Canberra. He was in Murgon on Friday enjoying a well earned rest at his nephew's house. The former tour guide said nothing could have prepared him for this epic journey. "When I started out I had a 60kg pack, I have worked out how to travel lighter and now my pack is only 10kg," he said. As one can imagine, the dangers of walking across the country are many and varied. "There are some crazy drivers out there," he said. "I have had some run-ins with wild animals like cassowaries and wild dogs." At one point early on, the epic journey almost came to a fatal end. "I was up in the Cape and I hadn't seen anyone for two days and I was running very low on water," he said. "It was about 100kms to the next town and I started to think, maybe I'm not going to make it." Being a spiritual man, Mr Doolan began to ask for support from a higher power. "I was saying to myself please just someone come. Please just someone drive past," he said. Thankfully his desperate pleas were heard. "Next minute a guy drove past with a big water tank," he said. "He topped me up and I was good to go." Always the resilient traveller, Mr Doolan has remained focused right from the start. "I knew in my head that first day was going to be the hardest," he said. "It's a bit of a cliche but you just have to take it one step at a time." The Indigenous rights advocate will be stopping in to Cherbourg on Monday to talk to residents and catch up with some of the local organisations, including the primary school and the aged care facility. Mr Doolan is passionate about targeting the younger Indigenous generation. "I think our current education is teaching a curriculum that is not really culturally appropriate," he said. "Our Indigenous youth are losing their identity." Mr Doolan said when he eventually reaches Parliament House in May next year he was hoping the 7000km journey would not all be in vain. "I think we may have a new Prime Minister come the new election, so my arrival in May 2019 comes at a good time," he said. "I'm trying to put out as much awareness as possible that I am on my way to Canberra. "Hopefully I get an invitation and officially submit the formal notice upon the Australian government." Mr Doolan hopes his meeting will lead to an appointed First Nations person elected by the Indigenous community that represents Indigenous people. "Then we can start making changes within our communities," he said. A Go Fund Me page has been set up to assist Mr Doolan with travel costs such as water, food, shoes and other supplies. "I have gone through three tents already," he said.